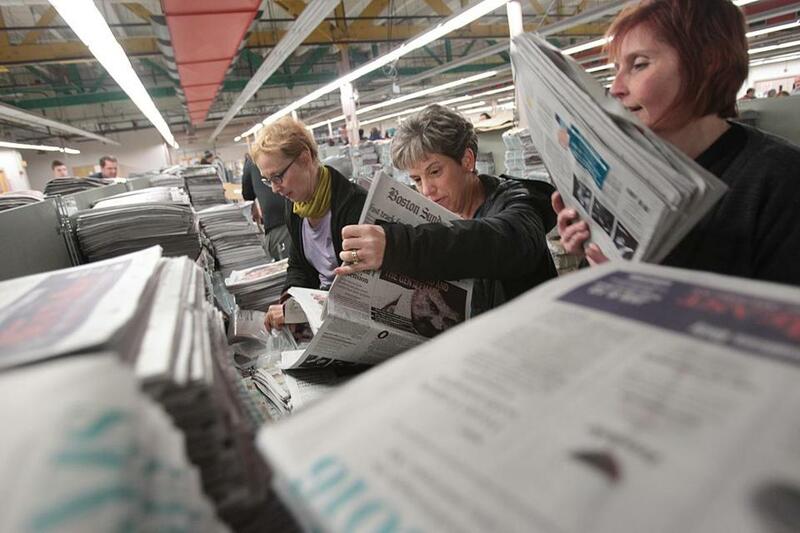 Linda Matchan, Janice Page, and Jane Bowman put newspapers into bags for delivery on Sunday. 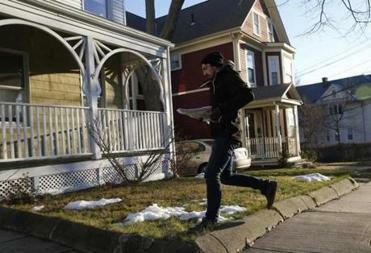 The last time I delivered newspapers, I was 12 years old, standing on the porch of one of my neighbors on Linden Avenue in Malden. It was collection day. Mr. Daly was a nice man and paid me promptly. Exact amount owed, to the penny. When I lingered on the porch, he turned back and sized me up. Scores of journalists worked to make sure subscribers received their Sunday newspapers. It was pretty good advice. And I ended up going into the newspaper business. So when the call went out Saturday for volunteers to deliver the Sunday Globe, a wave of nostalgia washed over me. It turns out the Globe had hired a company from, I believe, Mars to take over the home delivery operation and it has been a fiasco. So those of us who produce the newspaper were prevailed upon to deliver it. Being the gritty, streetwise metro columnist that I am, I had no question where I was going to hit the streets. “I’ll take Hingham,” I told the guy at the distribution center in Pembroke. Knowing that I’d be cruising the mean streets of Hingham in the early morning hours, I knew I’d need a serious wingman. In this case, wingwomen, two of ’em. I chose Teresa Hanafin, because she grew up in Dorchester and nothing fazes her, and Bella English, who didn’t grow up in Dorchester but works much harder than Teresa and I work and would gladly walk up driveways we couldn’t be bothered with. We kept returning to Liberty Pole, up and down Pioneer Road and Patriots Way and Minuteman Road. In the course of six hours, Bella developed a severe aversion to Revolutionary War history. And she swore a lot. More than I swore. Which is saying something. Unlike Bella and me, Teresa had the foresight to bring a flashlight along, which is pretty handy when you’re stumbling up a darkened driveway at 3 in the morning. We took turns using the flashlight to find the house numbers, some of which weren’t there, others of which were covered by wreaths and assorted seasonal decorations. There is no question that if we had meandered around sections of Texas and Florida the way we did the yards of Hingham early Sunday morning, we would have been shot dead. The papers were wrapped in plastic bags, to protect them from the elements and to make them easier to throw. At one house, I threw the bag a little too hard and it banged noisily against the storm door. Suddenly, the front light came on and an elderly woman appeared at the door, pulling a bathrobe tight around her shoulders. “Who are you?” she demanded in a loud whisper. In situations like these, I have always found honesty to be the best policy. “My name is Brian McGrory, ma’am,” I replied. I turned and ran, yelling back over my shoulder that, as much as I’d like to chat, I had 273 newspapers to deliver and not for nothin’ but I truly appreciate her loyalty as a reader and surely she should take those slings and arrows directed toward the great and the good of Hingham as nothing more than good-natured ribbing. I’m fairly sure she heard none of this. I jumped in the front seat and told Bella to burn rubber. Sound stupid? Here we were, 4 in the morning, stumbling around the winter lawns of Hingham like three blind mice. That doesn’t sound stupid. That is stupid. That said, all those hours in the car and furtive creeps up pitch-black driveways gave us perspective and appreciation, both for the people who deliver our newspaper and those who read it. Whatever they pay the delivery people, it’s not enough, and it’s more than a little depressing to think this debacle has been brought about by a desire to pay them even less. Whatever I’ve tipped delivery people in the past wasn’t enough. And rather than be upset by all the complaints by longtime subscribers about abysmal service, it was actually heartening to realize how much so many people look forward to their Globe every morning. The least we owe them is getting the paper to them promptly. It’s on us. It’s all on us.